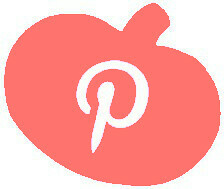 Looking for a fun Halloween treat to make this weekend? 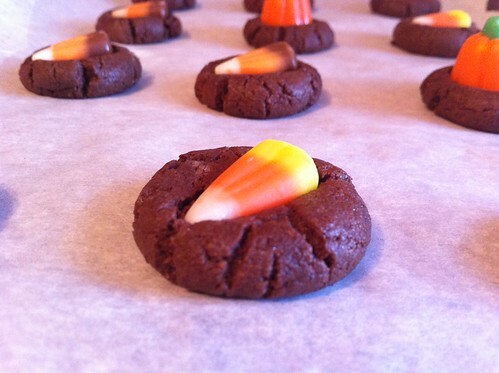 I know it's possible people are getting sick of combining candy corn and chocolate if they've been reading my blog this month, but these are really the ultimate Halloween cookie. 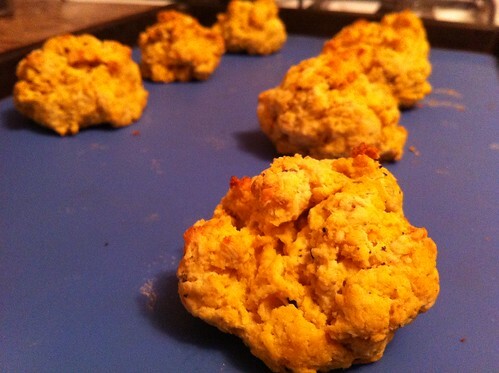 Ever noticed how everyone is absolutely gaga over Red Lobster's cheddar biscuits? I've never thought they were that special. Although I guess you can't really go wrong with cheese in a biscuit. Which brings me to my next point: you can't go wrong with cheese AND pumpkin in a biscuit. What was Pumpkin Week 1.0 missing? 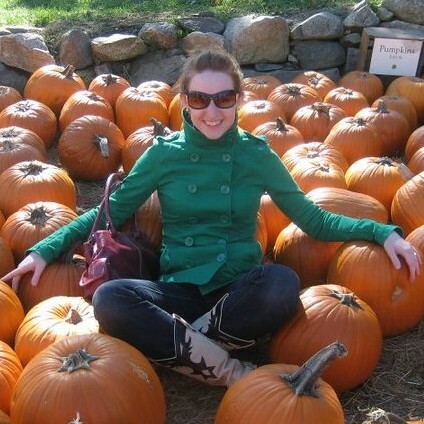 Ahh my favorite time of year: Pumpkin Week! 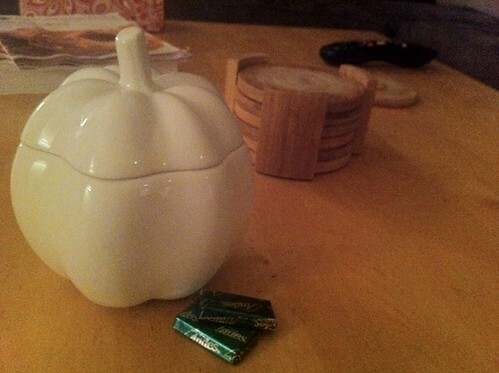 Okay, so it took Monday off as a pumpkin holiday, but it's here now in full force. 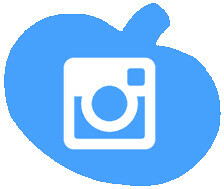 Stay tuned for pumpkin-themed posts all week! 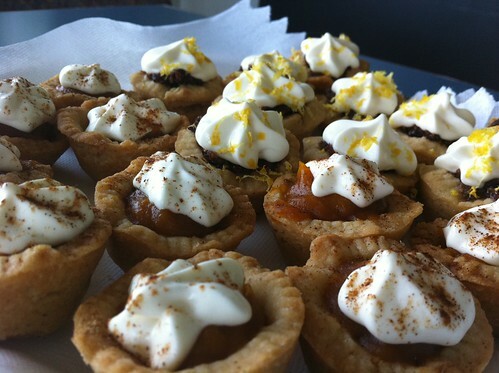 Love pumpkin pie but hate using a plate and fork? 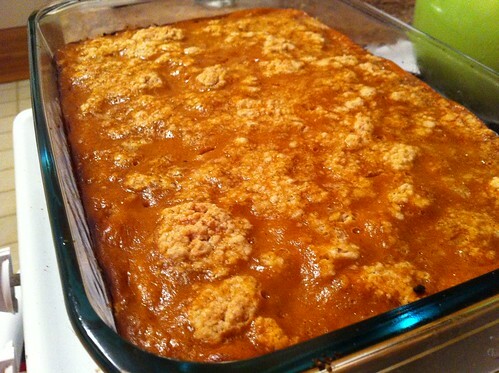 Solution: pumpkin cobbler bars. If you remember my Berry Chocolate Cobbler Bars, you know I love cobbler. Crumbly, buttery goodness. 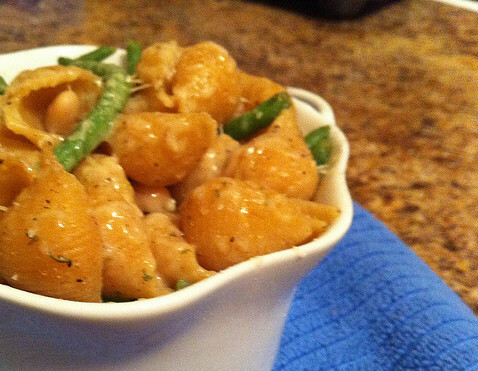 Plus, it only takes a few ingredients and is fairly quick to throw together. Remember how my last post was about laying off the fatty comfort foods? Couldn't last, right? I actually don't know where falafel lies on the health spectrum... it's made out of nutritious, lean, high-protein ingredients. And then you deep fry it. Everything's a give and take, right? Lately it seems like all I've been eating is bread, cheese, pasta, pie, and pumpkin spice lattes, because hey, it's Fall. I love this season, and all the hearty food that comes with it, but sometimes I have to remind myself to take a step back and lay off the butter. 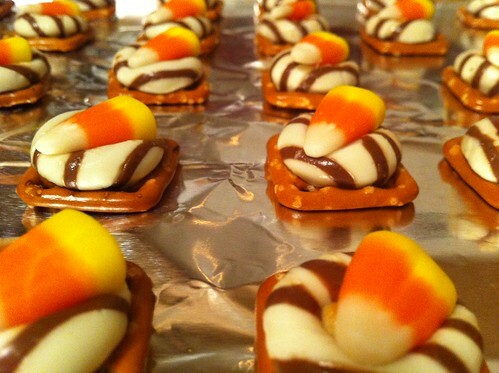 Did you read my last post and think: "hmm I sure do like putting candy corn on things, but those cookies seem like too much work..."? Full disclaimer: I hate candy corn. I hate the texture. I hate that the only ingredients are corn syrup, sugar, and red no. 6. What I DO like is that they're so darn cute. And somehow in these chocolate cookies, they're not half bad. 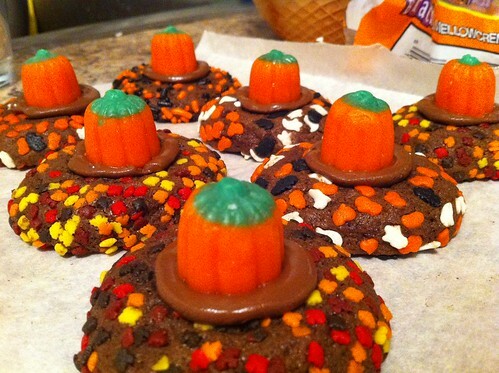 And they make a simple cookie into a themed treat. 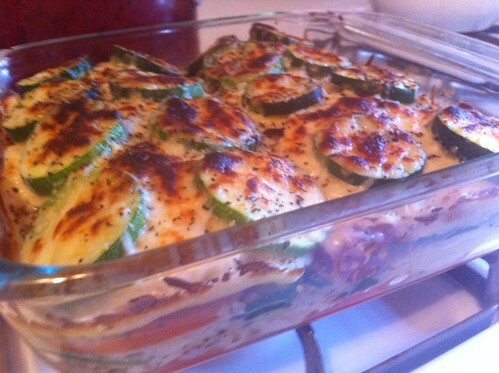 Another hot cheesy baked dish for fall! My friend Carol shared this recipe with me years ago, and it's been a standby ever since for an easy lasagna substitute. Ravioli takes the place of lasagna noodles and meat, and the liquid from fresh vegetables plus some seasoning replaces a heavy sauce. 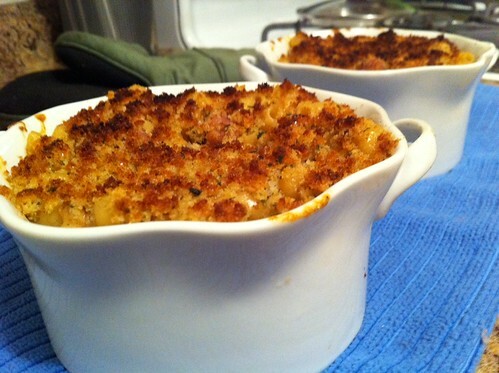 I'm sure there are half a million blog posts that start out by describing the wonders of mac & cheese. So I'll skip it - we all know it's amazing. 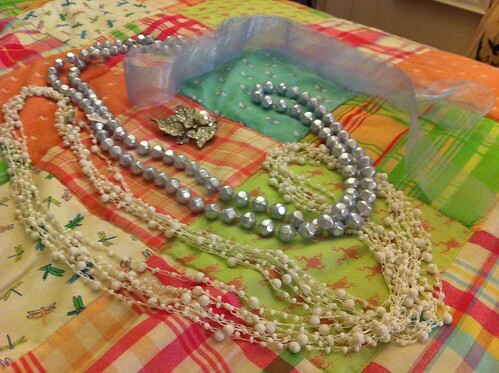 There I was, walking to yoga class on a beautiful Saturday morning, when I stumbled upon a yard sale. Living in the city with no car, I don't frequent yard sales. But I just might start. You know when you're starving, you want something hot and hearty, but you feel like there is absolutely nothing to eat in your kitchen? I get that a lot. Luckily, I always have pasta. And beans. And usually at least one variety of frozen veggie. While I cooked a cup of whole wheat shells in some chicken broth, I steamed some frozen green beans over a saucepan of water. 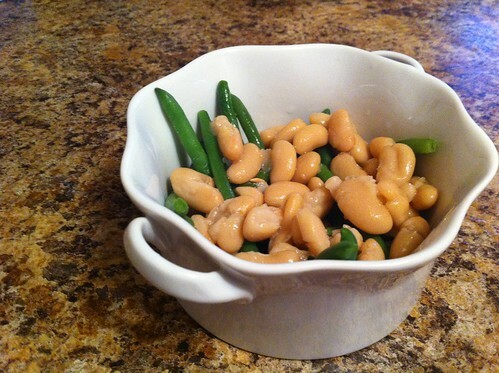 I strained the green beans and about 4 ounces of white cannelini beans and plopped them into a ramekin. 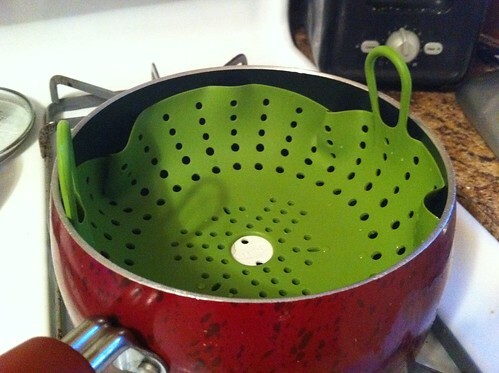 Isn't this silicone steaming basket fun? Anyway, I digress. Once the pasta cooked, I drained it and tossed it with 1/2 tablespoon of butter, salt, pepper, dried basil, and a little garlic powder. 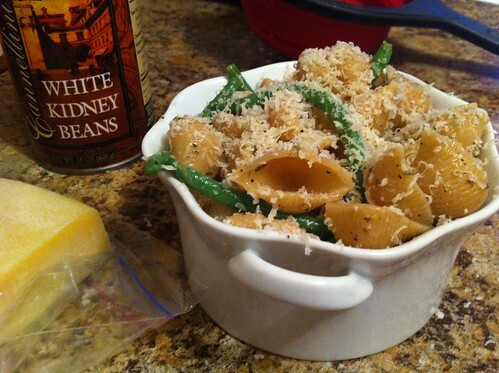 Then I mixed the pasta in with the beans (green and white) and topped it with a tablespoon of freshly grated parmesan. Into the oven for about 8 minutes on 350, and then under the broiler for about 2 minutes to finish it off. 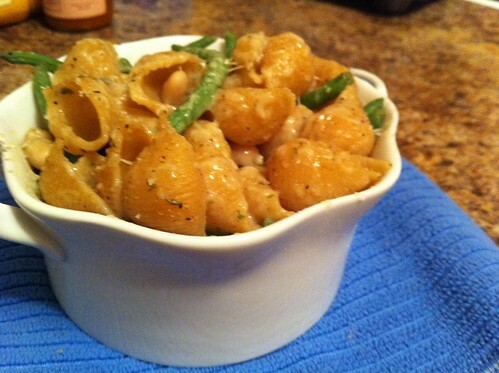 Whole wheat pasta for starch, white beans for protein, green beans for your veggie, and a little cheese and butter for delicious. 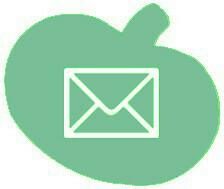 As is becoming all too frequent, I've been away from the blog for a week (or so) hiatus. But this time, I have a good excuse, as I was in Las Vegas with my sister. My sister Cabell and I split these two breakfast dishes. Sadly that glass of water is blocking the gravy boat full of whipped cream. Did you know Jack Daniels and Ginger Ale comes pre-mixed?? 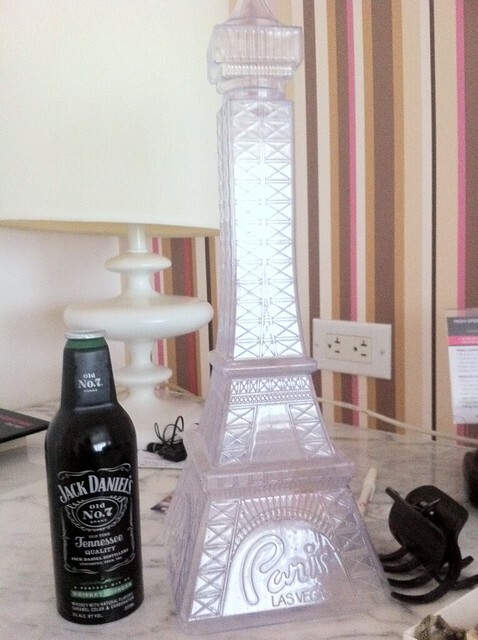 And yes, that Eiffel tower was full of booze. 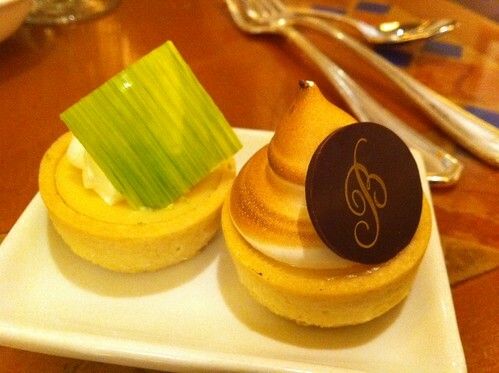 Adorable mini key lime and lemon meringue tarts. Complete with the signature Bellagio B. Go West, young man, and drink novelty glasses of frozen cocktails. I've been lusting over a certain pair of strappy high heels all summer, thinking my time was running out to buy them. But really, I realized, they'd work for fall too. Hallelujah. And the more I've been looking at summer sales, the more I realize that a lot of these strappy leather numbers in neutral colors could transition to autumnal outfits quite easily. With naked toes or paired with opaque tights if you're feeling bold (or cold), these pumps would look great with a fall trench. 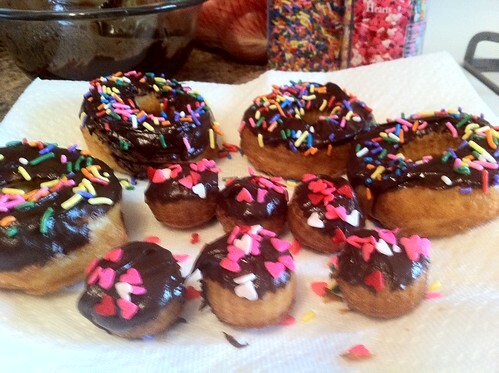 One of the first things I knew I had to make with my new deep fryer was donuts. 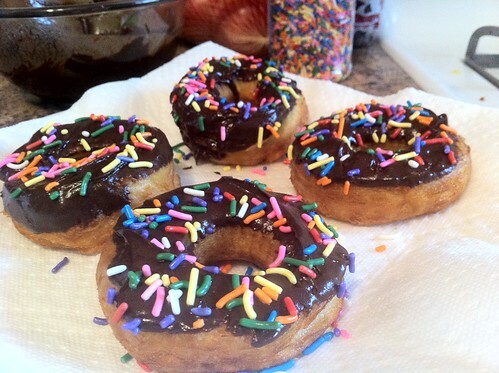 If you know me, you know I cannot resist a donut, preferably with chocolate frosting and sprinkles. 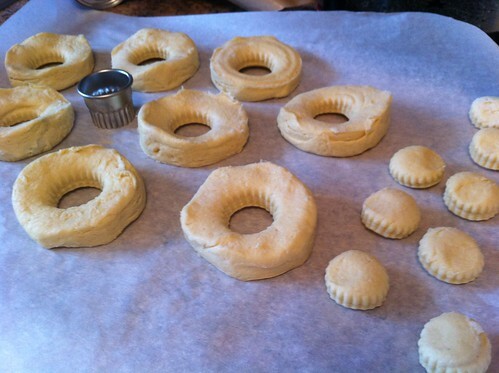 But yeast donuts seemed so time consuming, I was putting it off until I had a big chunk of time available. 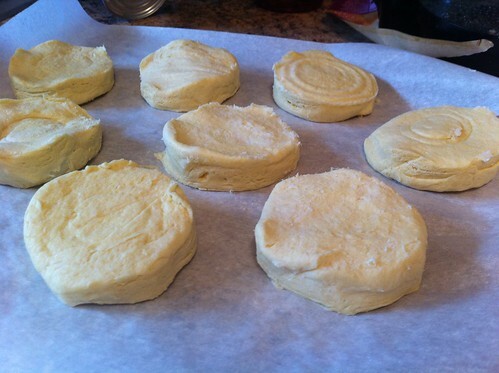 However, after perusing the internet for donut recipes, I was surprised to find one appearing over and over: cut holes in refrigerated biscuit dough and deep fry it. 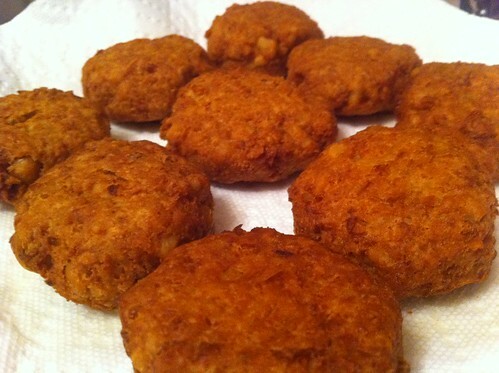 Deep fried biscuits? Masquerading as donuts? No thank you, right? But I KEPT seeing this "recipe" pop up online. With tons of positive reviews. So I thought, why not. Worst case scenario I waste $2 on a can of biscuits and about five minutes of my Saturday. And turns out, they were outstanding. Honestly, what I liked most about them is that they weren't quite as airy as your standard Dunkin Donut. You know, where you eat three donuts and feel like you were chewing air? Delicious air, but still not much sustenance? Well, the biscuit dough solved that. It's layered and light but still bready. And no, they really don't taste like biscuits. Once they surface from that deep fryer, they taste like donuts! 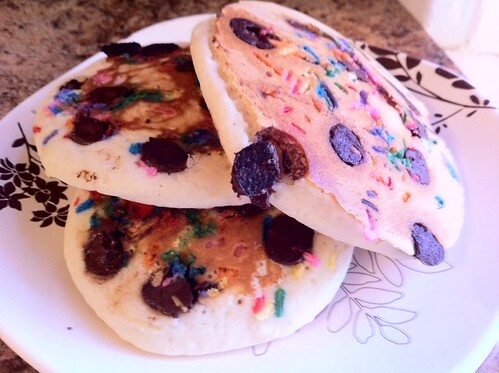 In the microwave or double broiler, melt chocolate chips, butter, and corn syrup until smooth. 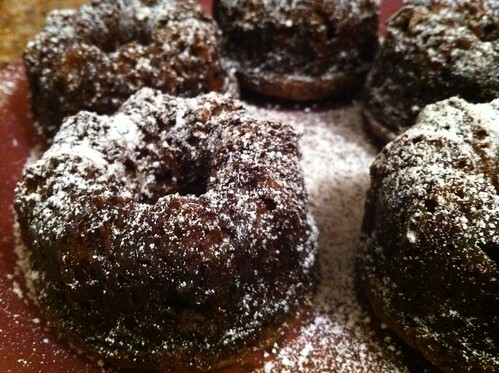 Keep warm over the double broiler or re-microwave if necessary to keep the glaze thin while frying your donuts. Fry the donuts quickly! I dunked them for about 30 seconds per side, which worked perfectly without over-crisping. Drain for a minute or two on paper towels. 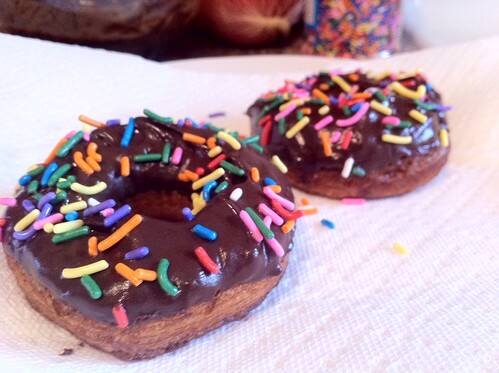 Dunk in chocolate glaze, then immediately coat in sprinkles. Devour. I finished off all 8 of these in less than 24 hours. No shame. P.S. If anyone can figure out how to make that "butternut" topping Dunkin Donuts uses, throw a girl a bone over here. That's right, you read that correctly. 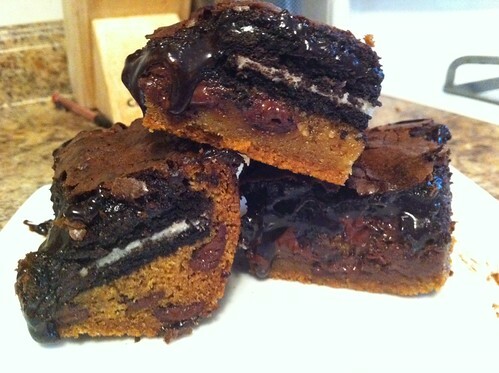 Chocolate chip cookies, oreos, and brownies, all in one bar. Oh, and also hot fudge. 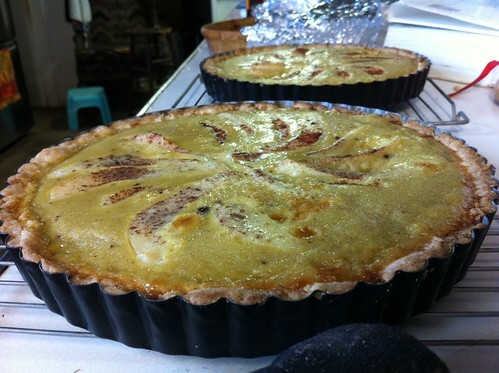 I saw this recipe from the blog Kevin & Amanda and was obviously drawn to it immediately. I love chocolate chip cookies. I love Oreos. I am basically addicted to brownies. All in one? 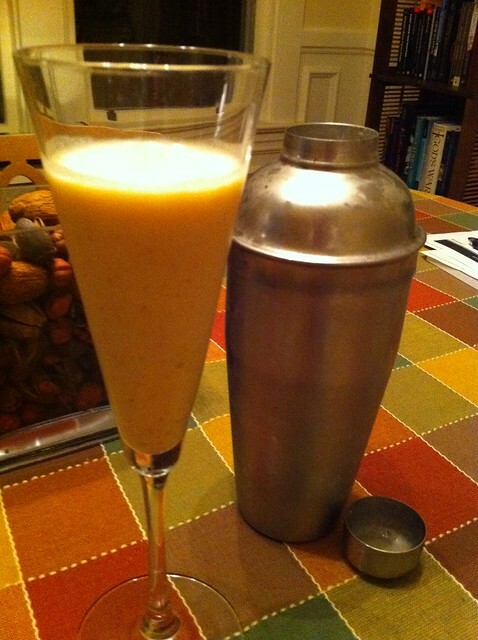 But it was so indulgent I didn't know when I'd have the excuse to make it. Enter a co-worker's birthday a week later. His favorite desserts were listed as brownies and chocolate chip cookie dough, so I figured there was no time like the present to whip these monsters up. And yes, they taste just like they look. Completely outrageous and delicious. The hot fudge mixed into the brownie batter stays gooey and oozes out while you're trying to eat them. I'd recommend a fork or a lot of napkins. Or just complete dessert abandon. 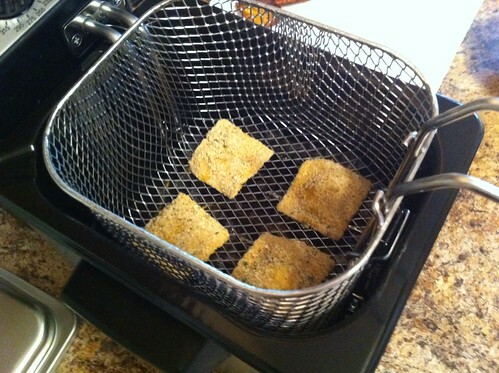 Of the many cool kitchen toys I got for my birthday, the most extravagant was probably my deep fryer! That's right. I now own a deep fryer. 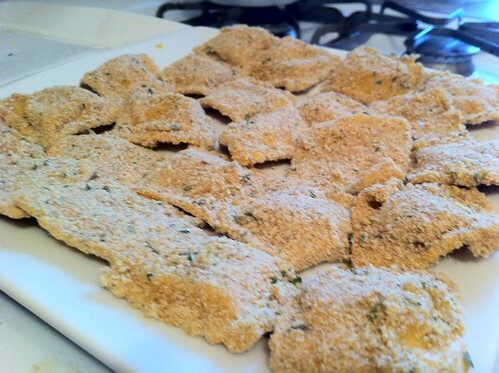 For its christening, I wanted to make something relatively simple but delicious, and toasted ravioli immediately came to mind. 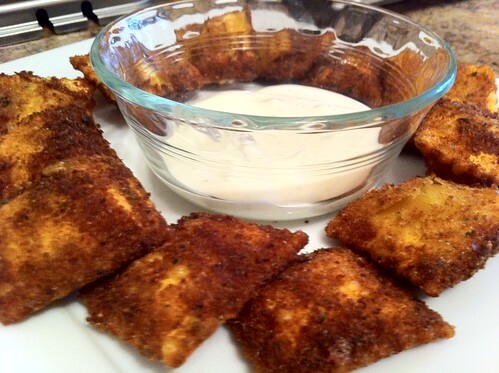 If you're not from Missouri (and relatively close to St. Louis), you might not know what toasted ravioli are. Well, they're delicious. 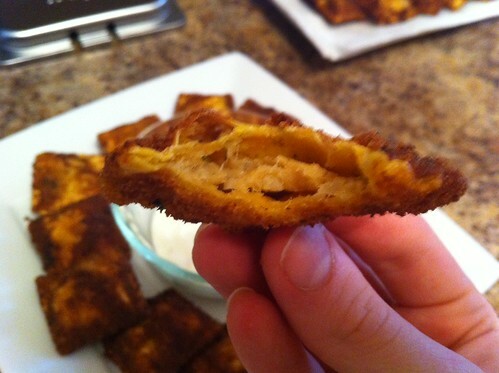 Akin to a mozzarella stick, you bread meat-filled ravioli and deep fry them. Traditionally they're dipped in marinara, but not being a big red sauce fan, I used an alternative. 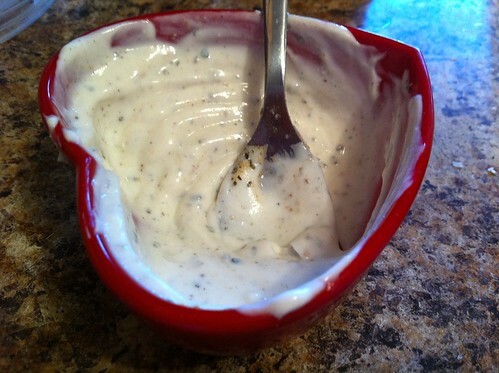 What else - blue cheese dressing. 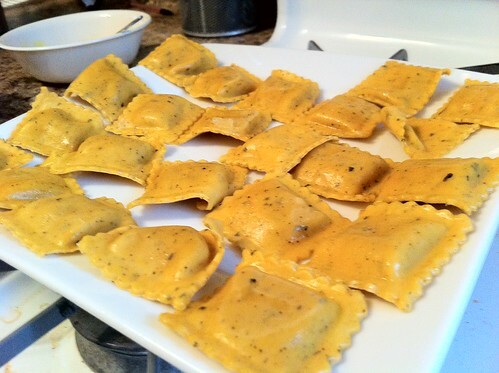 Finding beef-filled ravioli turned out to be harder than I thought, so I opted for Trader Joe's lobster ravioli. 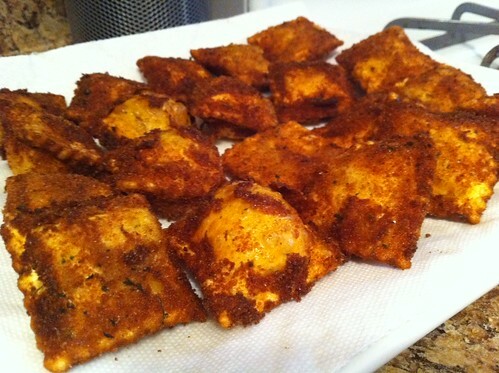 Hence, my final product became St. Louis/New England Style Toasted Ravioli, a very opportune meeting of cultures. Using one beaten egg and a cup of Italian style breadcrumbs, I dredged each raviolo in egg and then crumbs, allowing them to sit for 5-10 minutes before frying for the breading to set up. Into the oily depths of the deep fryer, four at a time. 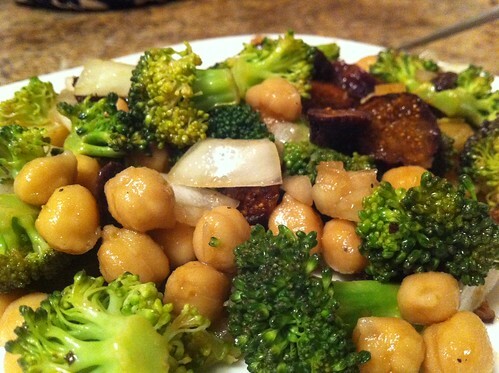 I used canola oil, although I hear peanut oil is great for frying, too. Don't these babies look amazing? I let them fry for 1 minute, then flipped them over with tongs, and then 1 more minute on the other side. Beautiful. And how'd they taste? To die for. Delicious crunch, soft lobster filling, and the blue cheese complemented perfectly. If you are into marinara, I'm sure it will taste great as well. I love breakfast. Who doesn't? Fried eggs, bacon, corned beef hash... more sodium, please. 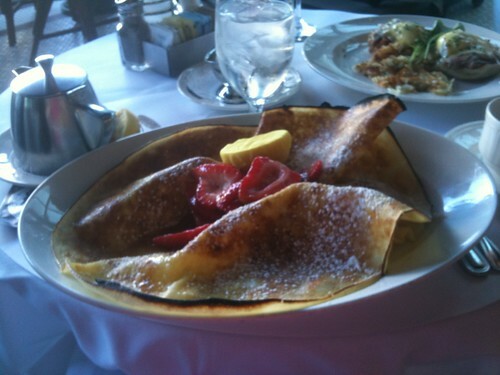 But occasionally pancakes are the only thing that will hit the spot. And occasionally plain old pancakes just won't cut it. 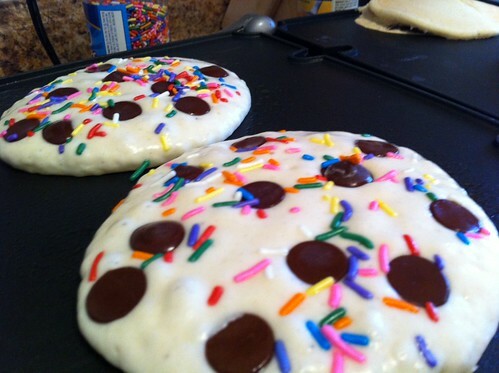 Enter chocolate chips and sprinkles. Pancakes are so simple and quick to make, and really not that bad for you (when plain). Maybe it was the fact that I'd slept late and hadn't had a meal in over 12 hours; maybe it was the abundance of cocktails from the night before... but I needed chocolate. And after adding some bittersweet chocolate chips, I thought they looked lonely. Sprinkles to the rescue. You know what would've made these even fancier? Whipped cream. And I considered it... but in the end, I resisted. Maybe next time. Mmmm parfaits. You could make me a beet and turnip parfait and I would still probably love it. Something about layers makes them delicious. So the other morning, for a quick weekend breakfast, I indulged in this one! 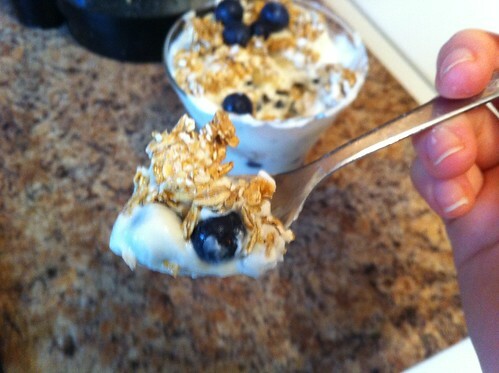 Greek yogurt, blueberries, and granola. 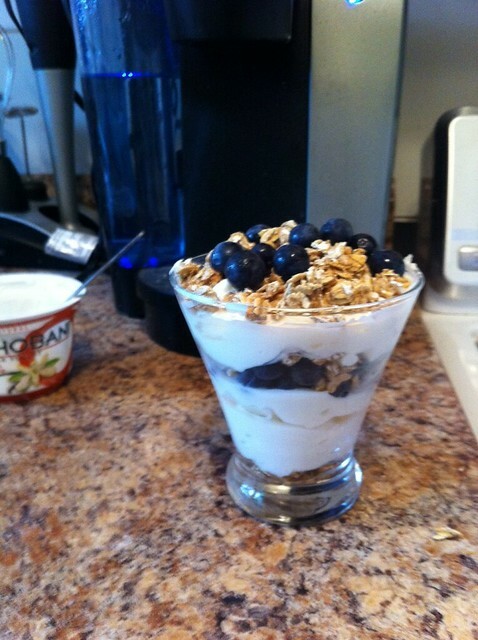 I used Chobani non-fat vanila yogurt with Kellog's reduced fat granola and fresh blueberries, but you could mix it up any which way, with frozen fruit, plain yogurt, or maybe some honey if you're feeling wild. Nom nom. Too delicious to take an in-focus photo. Mmm pizza. I did a post on homemade pizza this winter, but this one is different enough to warrant its own day in the sun. 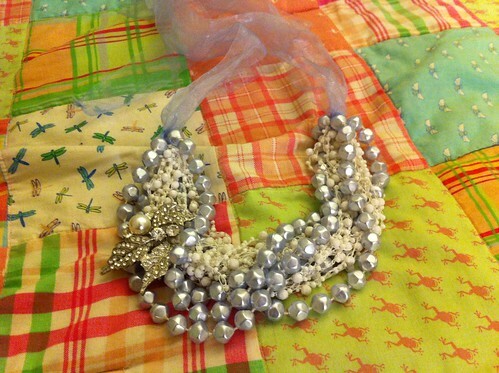 I got my inspiration for this at none other than Bertucci's (chain Italian restaurant if you're not familiar). I had a delicious brick oven pizza there featuring a lemon cream sauce, caramelized onions, and prosciutto. 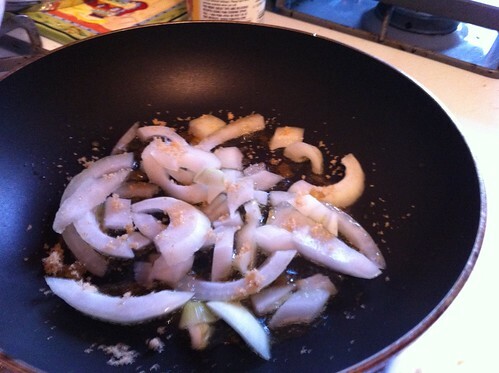 Sautee the onions in some olive oil and a pinch of brown sugar. Stir them occasionally to keep from burning. 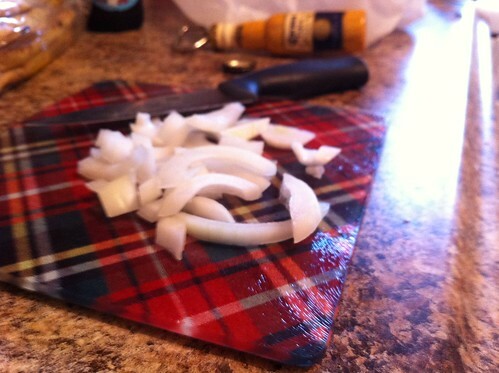 While you're waiting for the onions to caramelize, do a couple things. 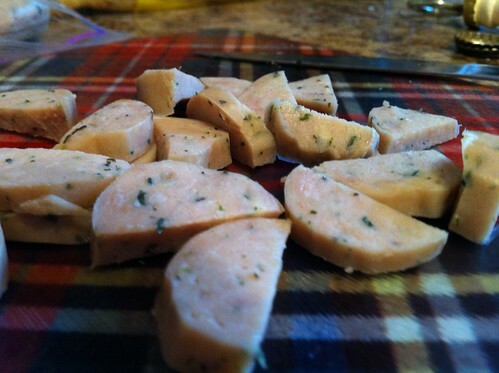 First: cut up some chicken sausage (I went with this over prosciutto because I had it handy). Next, make your "cream" sauce. For a lighter option, I made mine with Greek yogurt. I mixed two tablespoons of plain fat-free yogurt with about a teaspoon of lemon juice and spices: salt, black pepper, garlic powder, dried basil, and Paula Deen's "pepper mix" (everyone has that in their spice cabinet, right?). Mix, taste, re-season, repeat. I inevitably add more garlic powder. 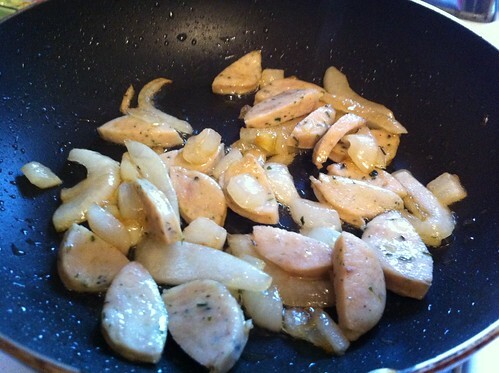 Once the onions are soft, throw your chicken sausage in with them. This isn't essential (assuming your sausage is already cooked), but it's nice to brown it and get the onion flavor really incorporated. 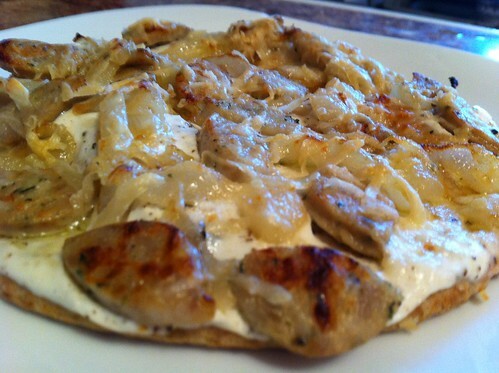 Assemble your flat bread. 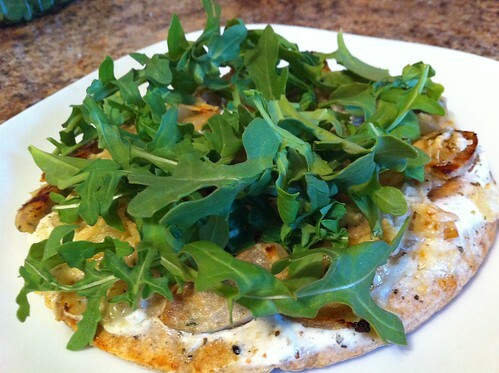 I used Trader Joe's whole wheat pita here, although I've used their naan before too for a thicker crust. 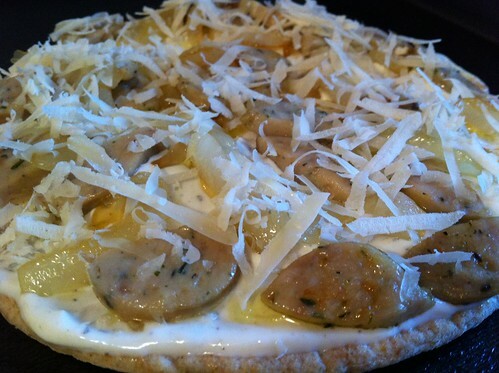 Spoon the yogurt sauce on and then top with sausage, onions, and a couple tablespoons of freshly grated parmesan. Into the oven. I cooked the flatbread for 6 minutes at 400 and then put it under the broiler for about a minute and a half. Golden perfection. Looks done, right? 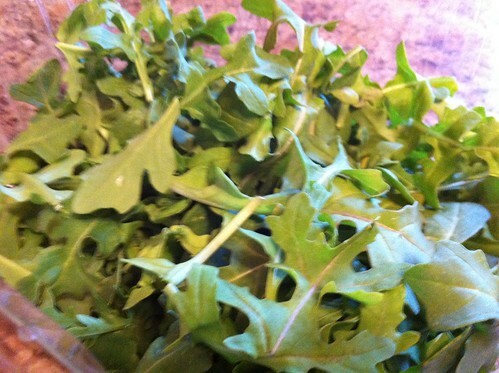 But not without my favorite ingredient: arugula. 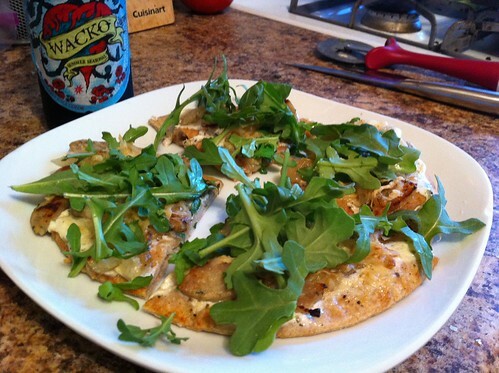 Slice your pizza and top with arugula to get some greens in. And add a Magic Hat Wacko to get some beer in.